TouchCall HMS is unique system to provide hotel room services on just single click. ThinkTechSol released TouchCall HMS 1.7 version to provide multi hotel service department wise online solutions. 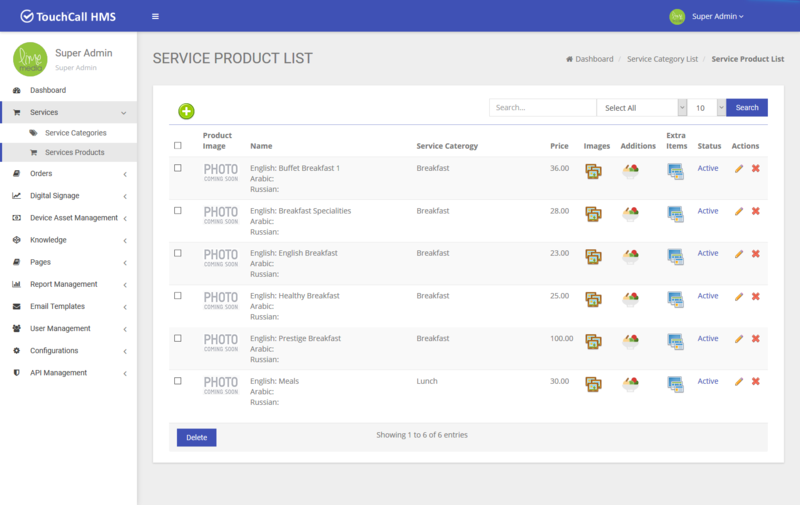 TouchCall HMS is module and functionality wise permission based application where admin and moderators can manage services and supper admin can keep an eye on whole system. Other features including APIs for mobile applications, Asset Management, User Management, Media Image / Video Galleries, Advertisement Streaming, Order Management, Article Management, Email Template Management, CMS for contents, and much more what you require in hotel touchCall services. The main idea behind TouchCall HMS is to install developed appliction on iPods installed in room. Where by default advertisement will be played. As any person touch the screen of iPod system will display the application layouts, where anyone can request for services i.e (grocery items, ketchen, utility bill, transportation, spa servoces, house keeping, business aminities). As order is placed, request for service is sent to relevant department and automatically print the request. Concerning department will fulfill service order and order receipt & service provider will be sent to room.